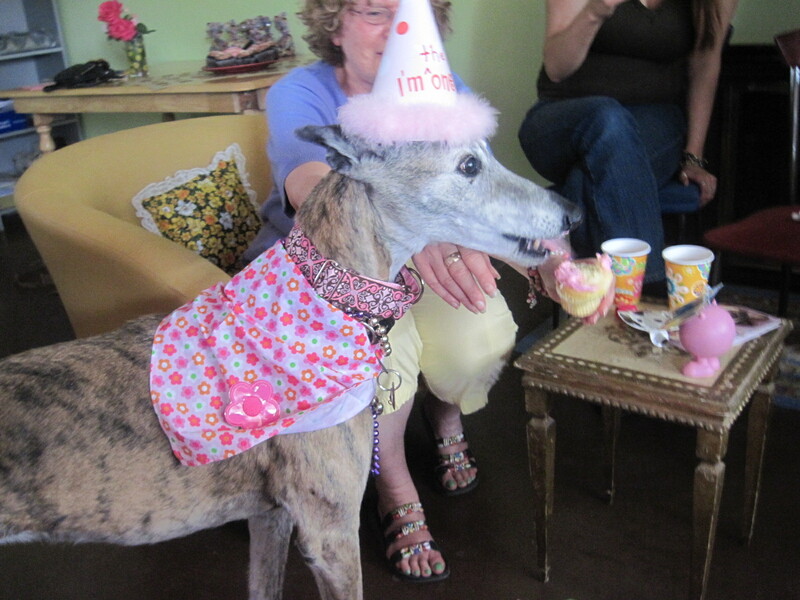 Girls – & Greyhounds – Just Wanna Have Fun! | Will My Dog Hate Me? Her impetus for devoting this time and effort to the cause? The dogs, of course. 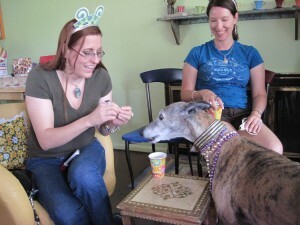 Karyn and her friends adore their sweet, sleek rescued greyhounds. I was privvy to some of that puppy love this past Sunday, at a birthday party for Lily, Karyn’s doggie drama queen, who recently turned 12 1/2. The Beading Divas — a group of crafters whose stylish bracelets help support greyhound rescue and other animal causes — were out in full force. 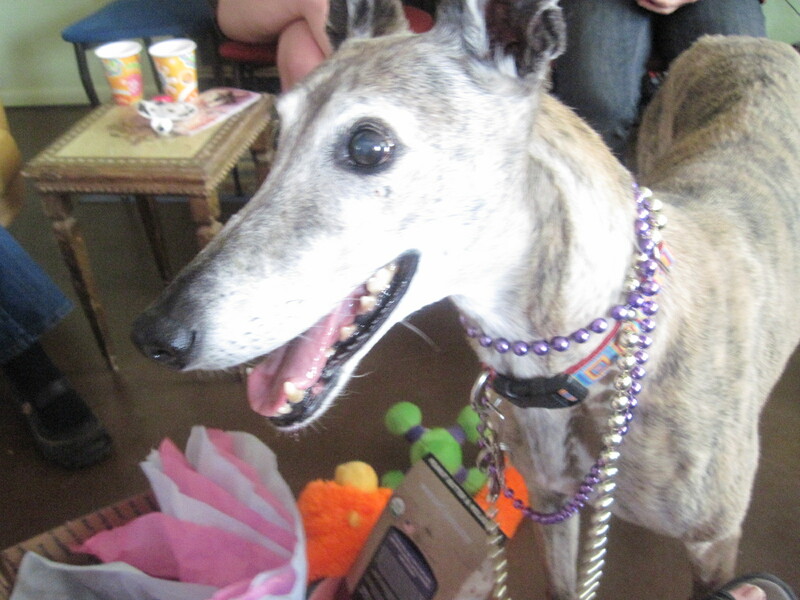 Along with being a Beading Diva, Michelle Caillet runs The Greyt Escapes hotel for greyhounds in Tucson as well as an Etsy shop where she sells her gorgeous greyhound oriented collars and leashes (yes, Lily got one of each for a gift). Lizzie Mead (aka Lizzie Stardust), in the first picture of this post, runs the Etsy shop where the Divas’ beaded bracelets are sold. Wide eyed with delight at all the attention! Did I mention April was Greyhound Rescue Month? Since I’m all about the crafts, this is a pretty neat way to raise funds for the doggies. You *are* all about the crafts Karen, o’ queen of DIY and contributor to The Bark on that topic, so I’m pleased you’re here to put your seal on the divas! What a happy looking girl! Great stuff. It’s nice to see dogs that come from such terrible beginnings find a good home. What a fun (and inspiring) post, and WHAT a gorgeous and happy dog — love it!!! Amazing that Lily is 12 1/2, isn’t it? My hat is off to Karyn. The courage it takes to see suffering, abuse and the amount of dogs that need help is beyond my ken. I would be a mass of jello after doing what she does. God bless people like Karyn. They are the real heroes. I’ve seen Karyn when she is reduced to Jello, but events like this keep her going. I am devoted to end the cruel sport of greyhound racing and will start with that dump in Tucson known as Tucson Greyhound Park. Fortunately, I am not alone in my efforts. Thanks for this wonderful post commemorating Lily’s special day. The beauty being that Lily just knew it was her special day. 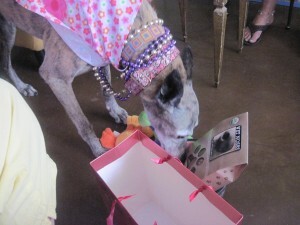 Ms. Lily’s special day is well documented in photos. Nice hat, Ms. Lil! I think I’d be wide eyed with excitement too getting all those great presents..and what a cute hat…! I’ve had the pleasure of meeting a few miniature greyhounds here at our local doggie park. I don’t think they were rescue dogs since we don’t have any race tracks here in Hawaii, but they were the sweetest pups you’d ever meet…and fast too! Congrats to Lily on her extra special day…! A lot of people just don’t know, Rod. There are similar abuses in horse racing — horses bred to the point that their legs are overly thin, sold for meat after their racing days are – but the stakes are higher so the industry is a bit more careful. That last shot is a beauty! What beautiful eyes she’s got, and the bling – quite the glamour girl. My first reaction was, wow – she’s 12 1/2??? How wonderful that she’s aging so well – do I sense a regal demeanor? Lily had some health problems but in the last year she had acupuncture and other nontraditional treatments and now she’s doing great. She is definitely regal. 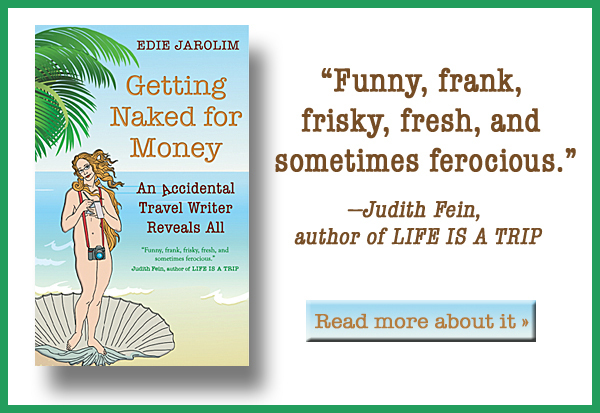 Karyn – I’m so glad Lily had fun. She’s just darling. 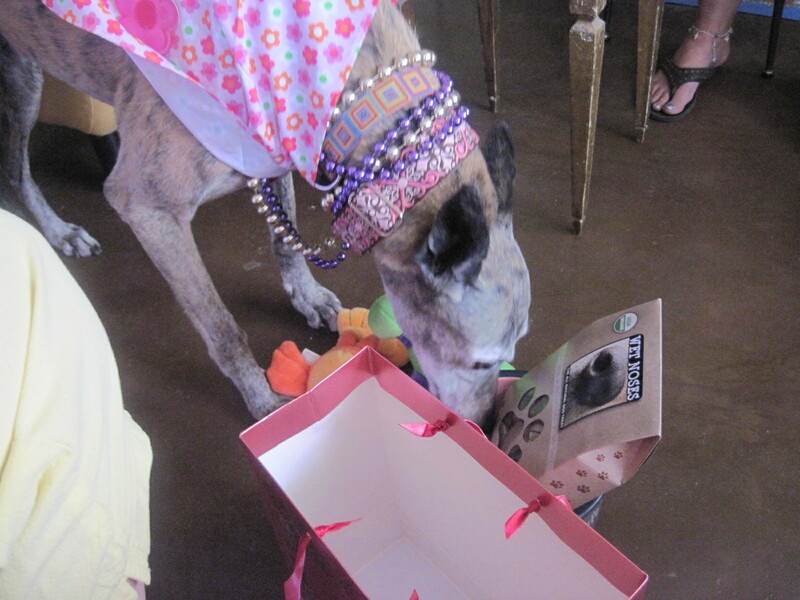 And Edie, I think it’s wonderful that you covered Lily’s special day and Karyn’s important work to help racing greyhounds. 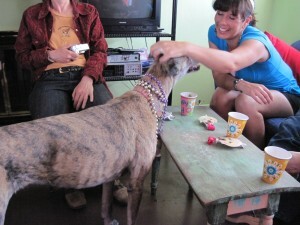 Pingback: Lily Greyhound, Departed Diva, Rest in…What?